Trondheim was Norway’s capital during the Viking era and currently is the country’s third-largest city with a population of just under 200,000. Our arrival there represented the mid-way point of our six-month trip through Norway, where we would return to Seattle for a couple of weeks before continuing south to explore the rest of the west coast. 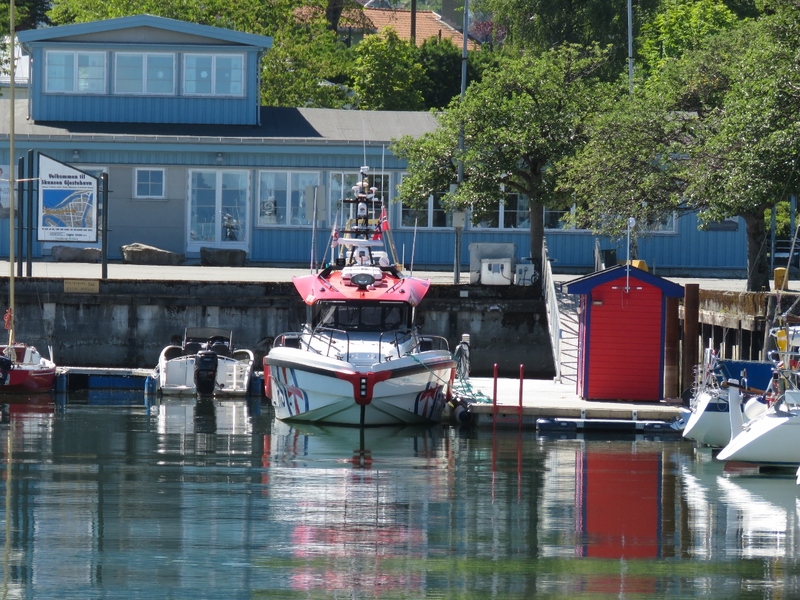 We arrived in Trondheim after a 185-nm, 3-night run from Svartisen Glacier through Norway’s sheltered inner lead. 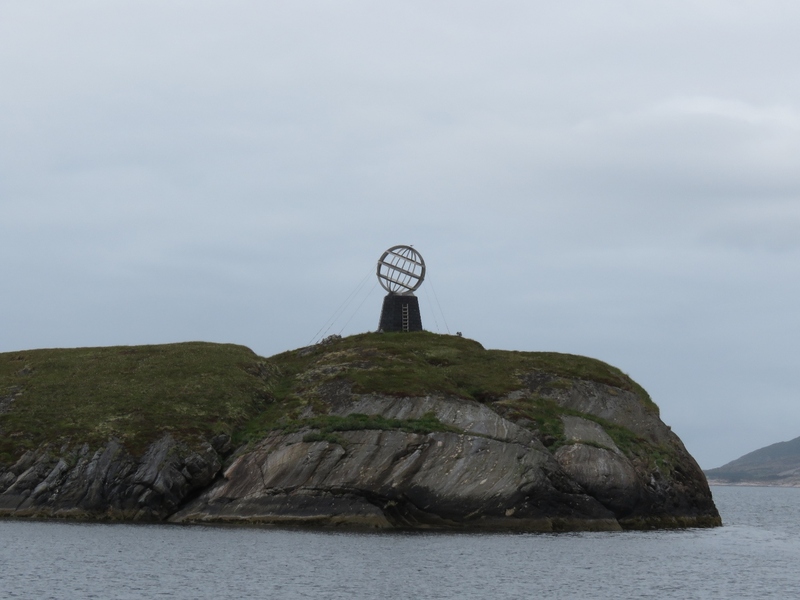 During the trip, we passed south of the Arctic Circle, nearly two months after first crossing en route to Røst from Træna. 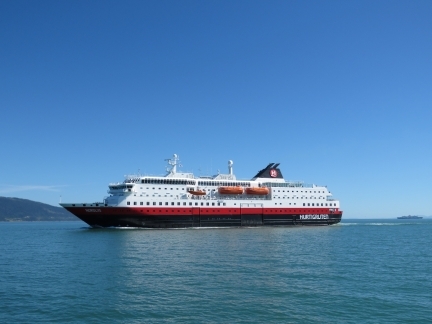 It’s been a fabulous adventure so far and we’re looking forward to the second half. The Hurtigruten Vesterålen running north. 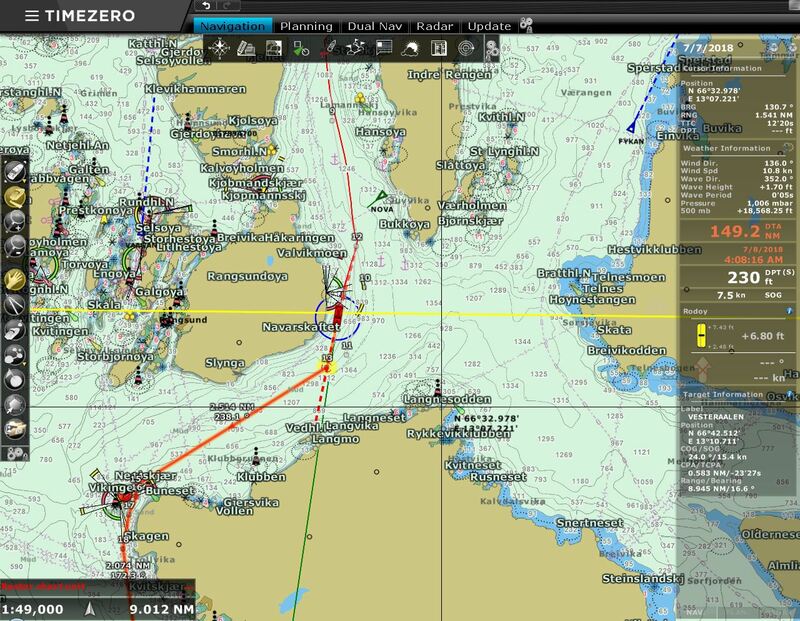 We’ve been north of the Arctic Circle (the yellow line on the chart) for nearly two months north, after first crossing en route to Røst from Træna. 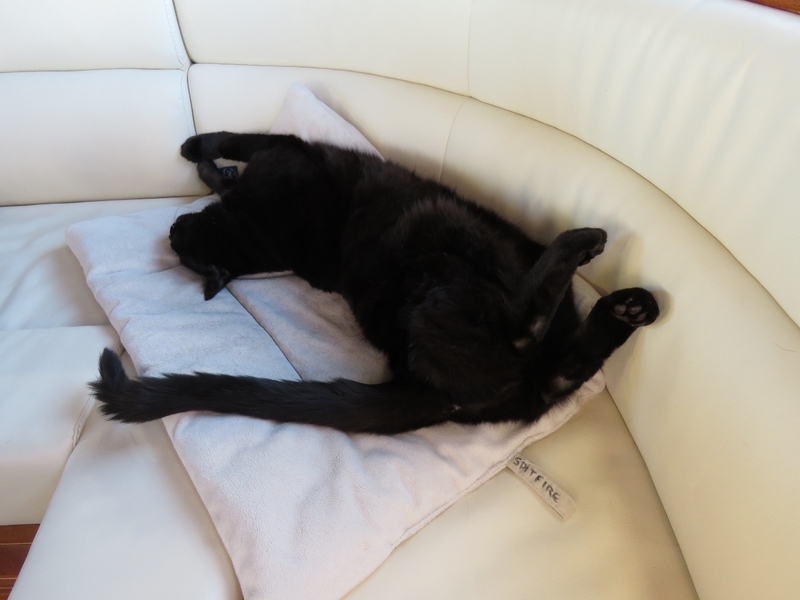 What a fabulous adventure. 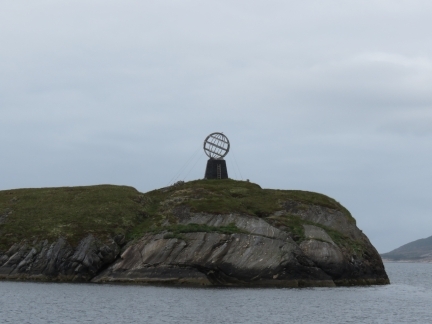 An Arctic Circle Monument, similar to the one on Træna, for those in the inner lead route north. 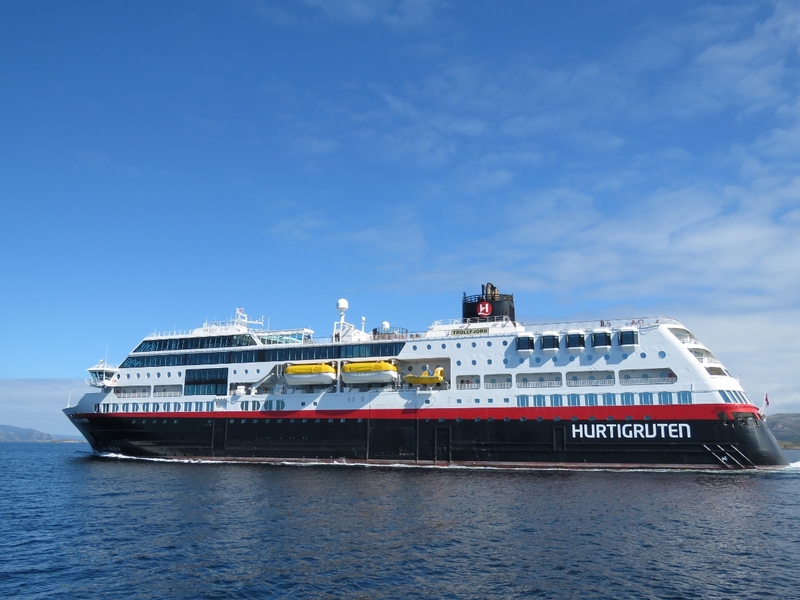 The Hurtigruten Lofoten heading south. 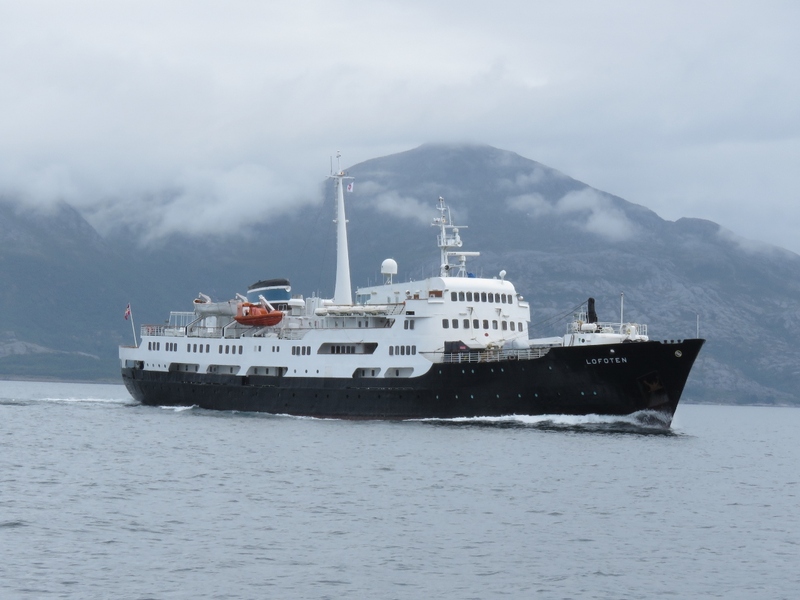 We ended up seeing the ship two more times today as they made stops and we caught up again. 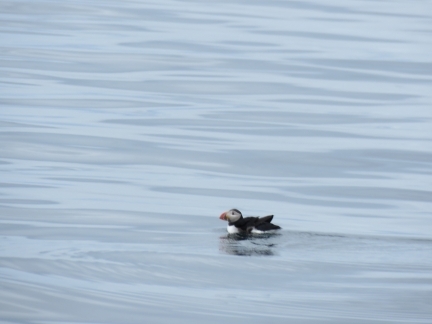 We’re southwest of the island of Lovund, a major puffin breeding ground, and spotted one in the water. 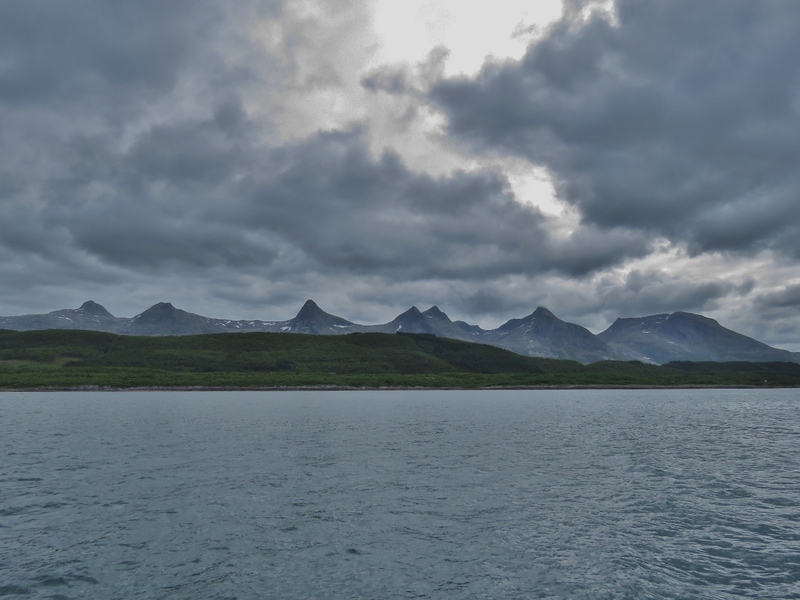 The 1,000m Seven Sisters mountain range. It’s hard to believe we hiked even higher than that, to 1545m on Helgelandsbukken. 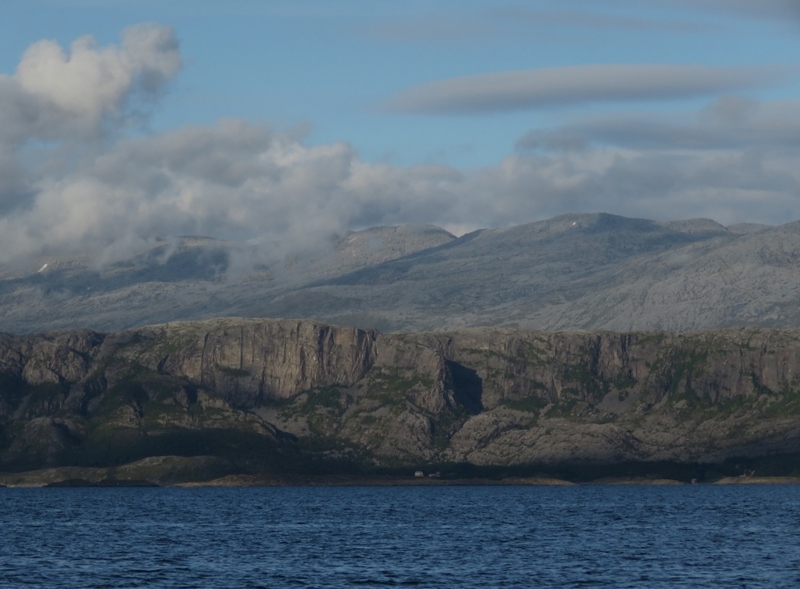 The view east to the island of Hamnøya and the mountains beyond from our anchorage off Vega. 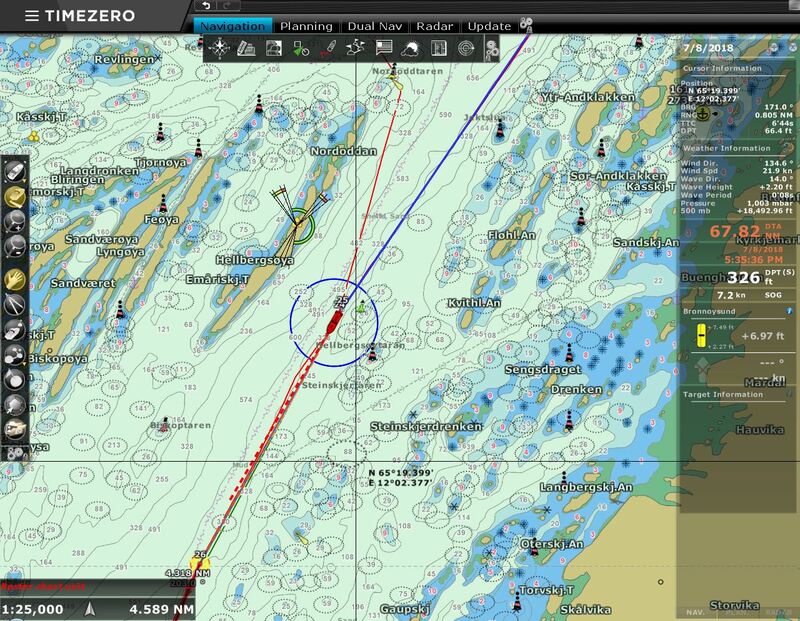 We passed just west of this anchorage on our route north two months ago, but we’ve yet to actually intersect. 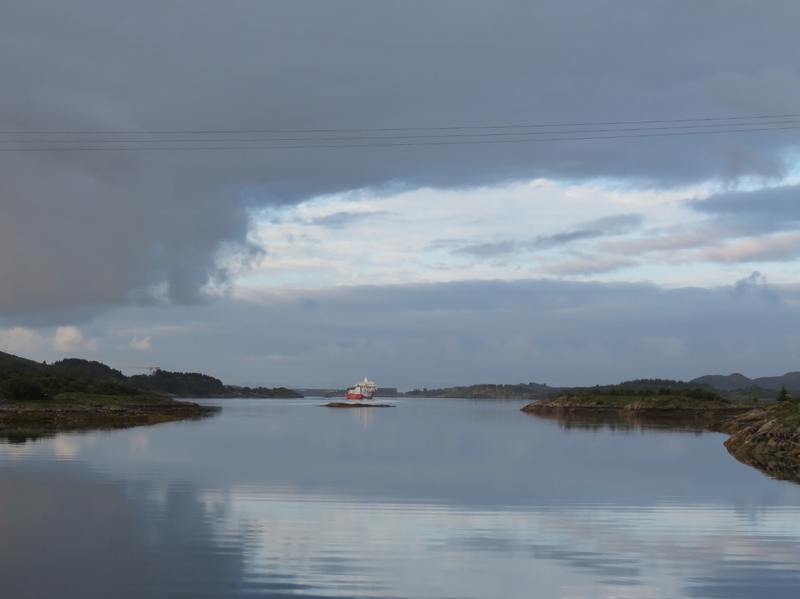 View west from the anchorage to the ferry docked at Vega as we get underway just after 5am. The fish carrier Ronja Ocean moored just outside Brønnøysund. 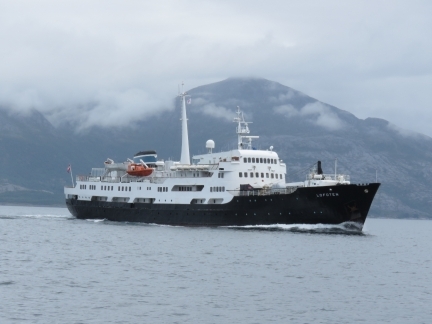 We’ve seen several Ronja ships during our time in Norway. 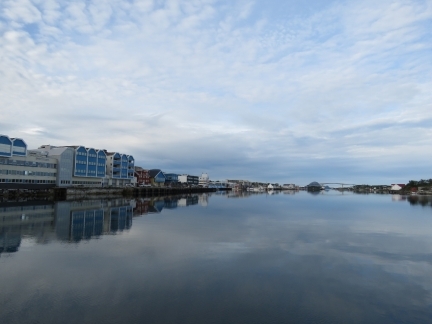 Beautiful calm waters in the channel along Brønnøysund. 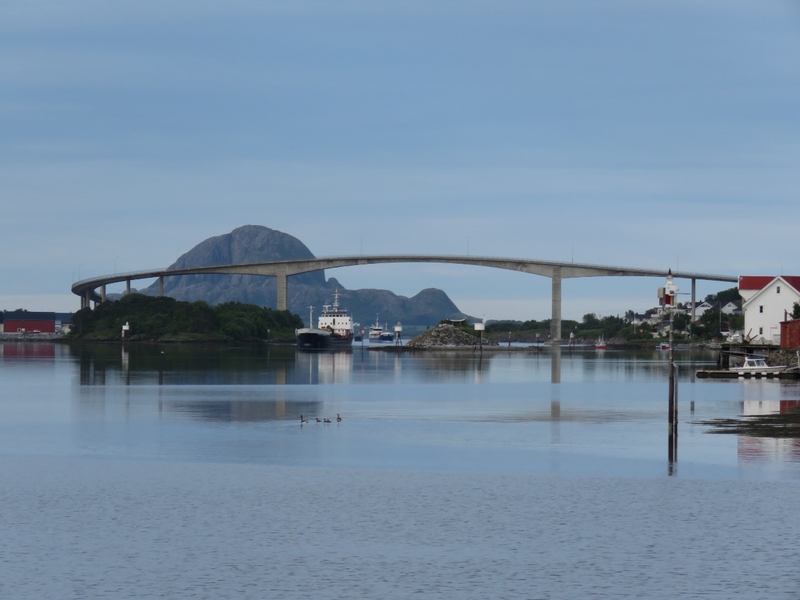 In the distance, we could see opposing traffic approaching under the Brønnøysund Bridge. 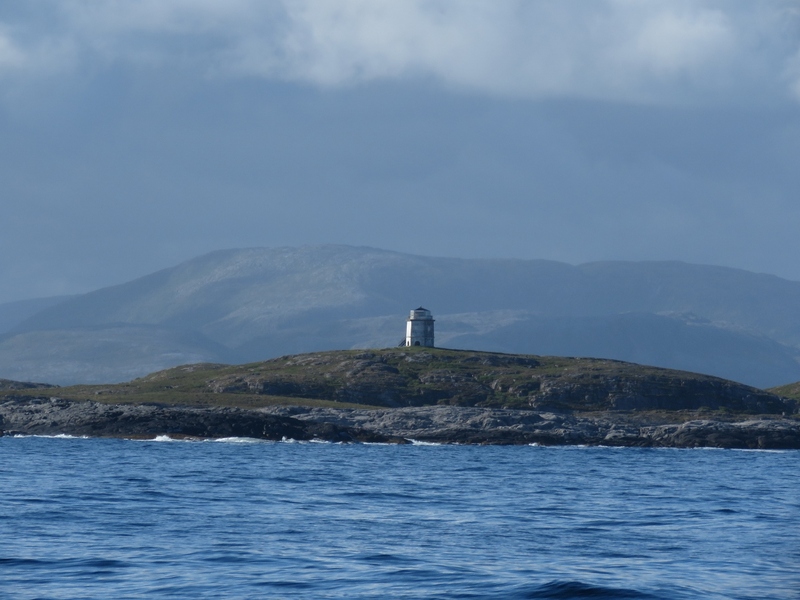 In the distance is with the mountain with the hole through it, Torghatten. Brønnøysund looked so appealing that we considered stopping at the guest dock, but it was only 7am, so a little early to call it a day. 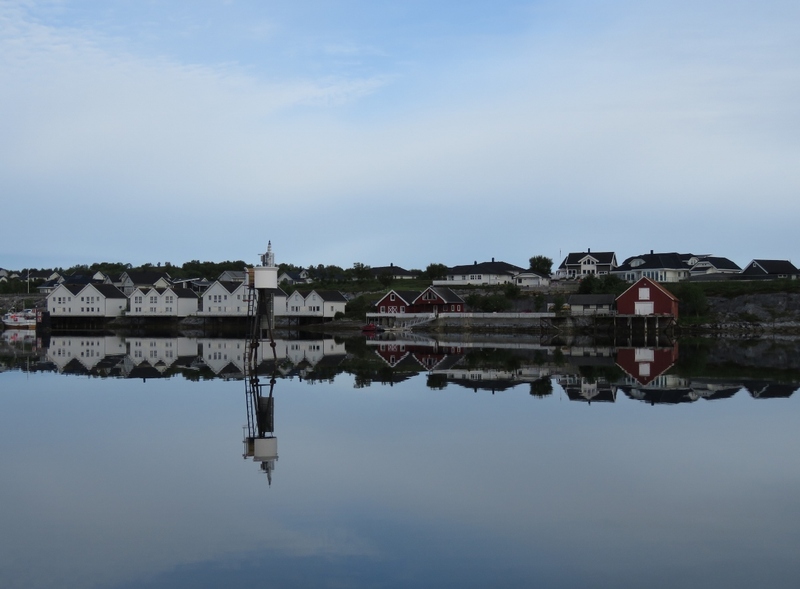 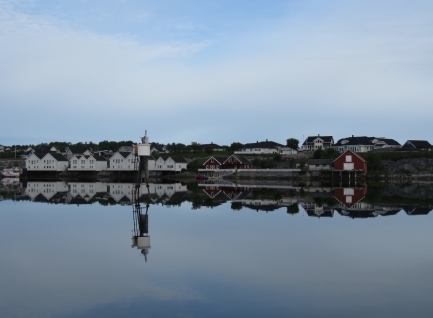 Traditional-looking buildings reflected in the calm waters off Brønnøysund. 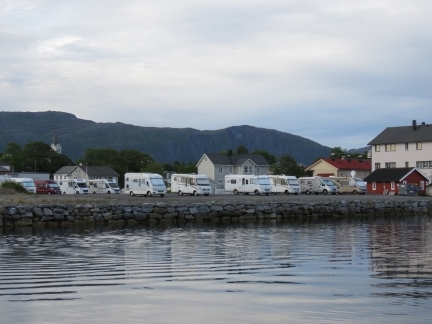 We’ve often seen RVs as we’ve cruised Norway—it’s a popular way to explore the country. 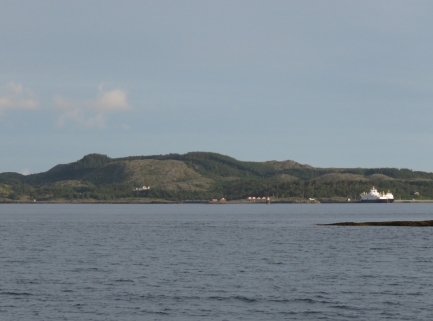 Passing the oncoming traffic off Brønnøysund, with not much space to give. 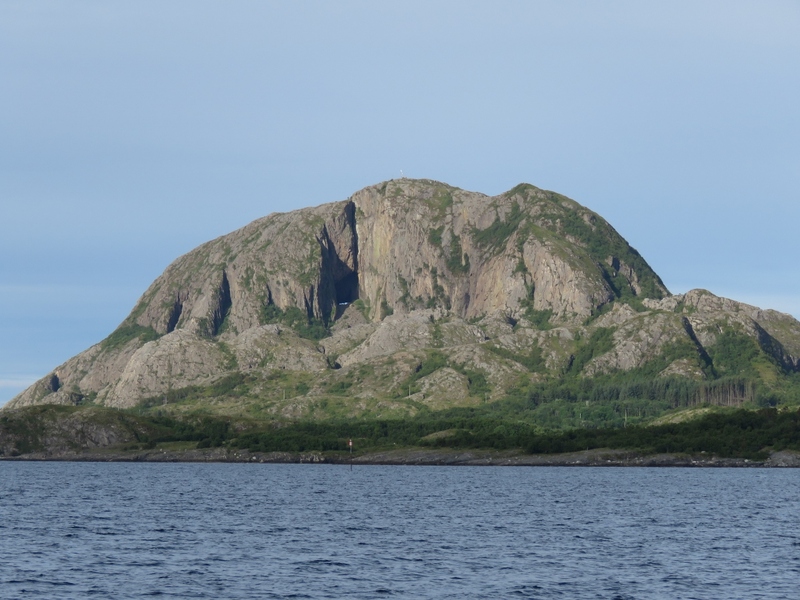 From this side, we can only barely see the hole through the mountain Torghatten. 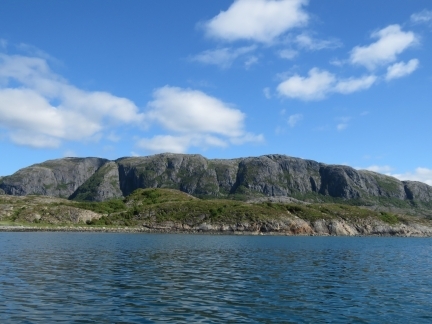 We’re finally rejoining our route north from May 14th along Norway’s sheltered inner lead. 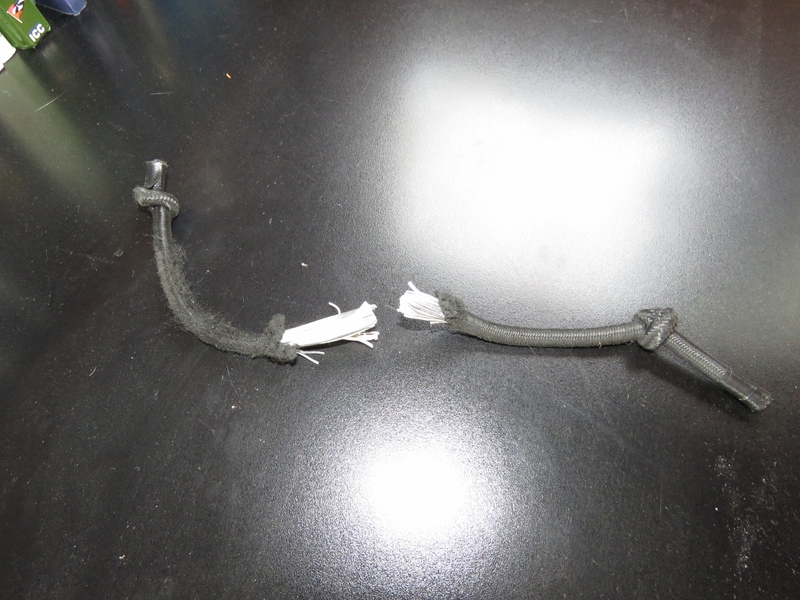 The bungee in one section of our canvas cover for the tender needed replacing, so we built a new piece from bulk bungee. 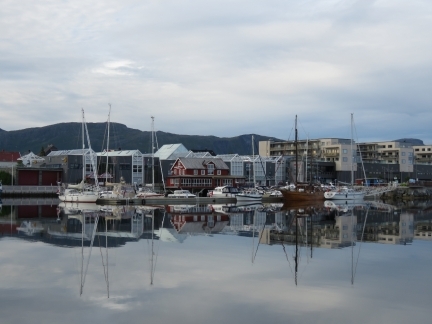 In Bodø we realized that the OS hard drive in our navigation computer was failing. 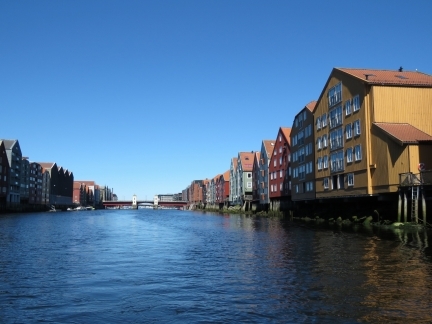 We’ve got a new computer on order that we’ll pick up in Seattle, so aren’t keen on investing a lot of time on the old system and have been trying to keep it limping along until we reach Trondheim. 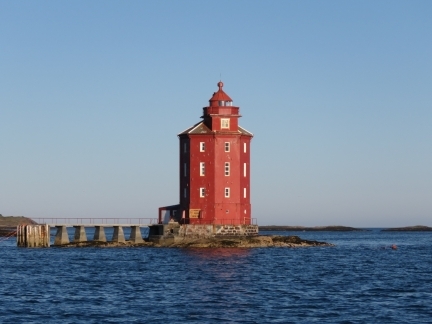 To reduce the stress on that disk, we moved our main database onto an external USB drive. We thought the transfer had gone smoothly until we attempted to backup the database underway and got this message indicating data corruption. 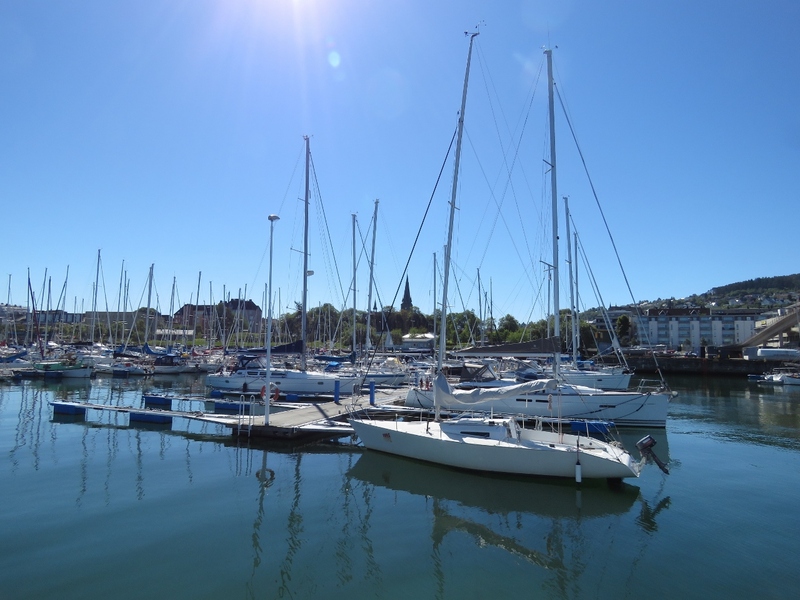 Fortunately we were able to recover the data from backups and get things running again, but it took more time than we wanted to invest. 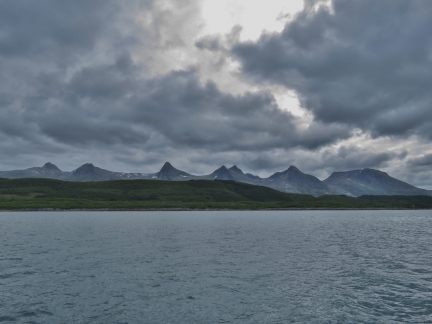 The view south as we depart that anchorage at Kråkøysundet, just north of Rørvik. On our charts and the satellite imagery, the channel appears exposed to the north and south. 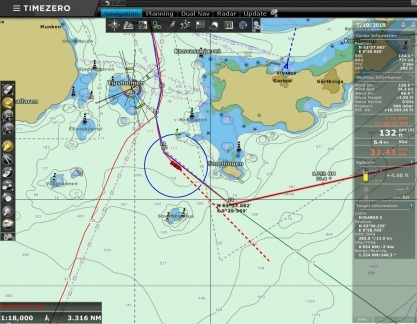 But the newer charts show a breakwater across the north end, creating a snug and protected anchorage. Rorvik’s award-winning coastal heritage museum. 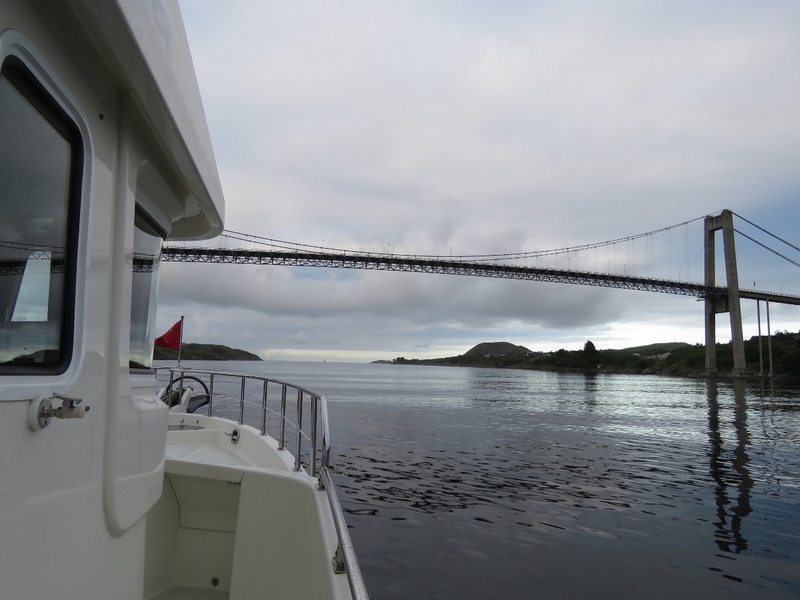 Passing back under the Nærøysund Bridge just south of Rorvik. The old coal-fired lighthouse on the island of Villa was in operation from 1839 to 1890. 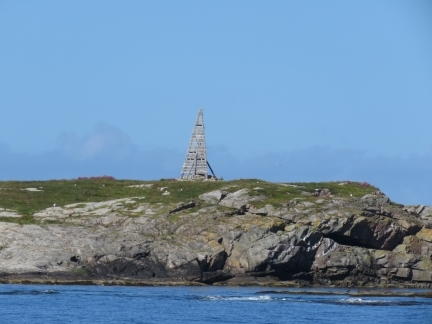 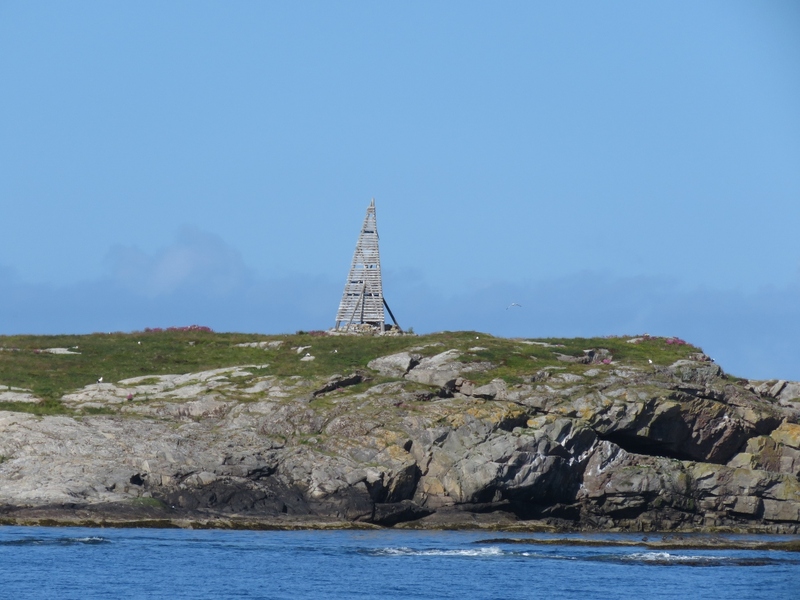 Old-style navigation aid on an islet to our west. 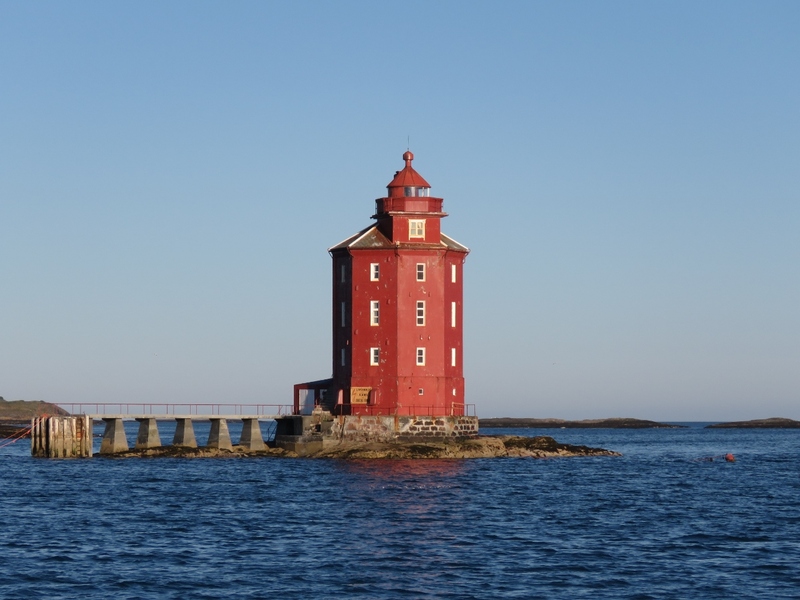 The red-and-white striped tower of the Sønnaholmen Lighthouse to our north. The Hurtigruten Trollfjord running north. 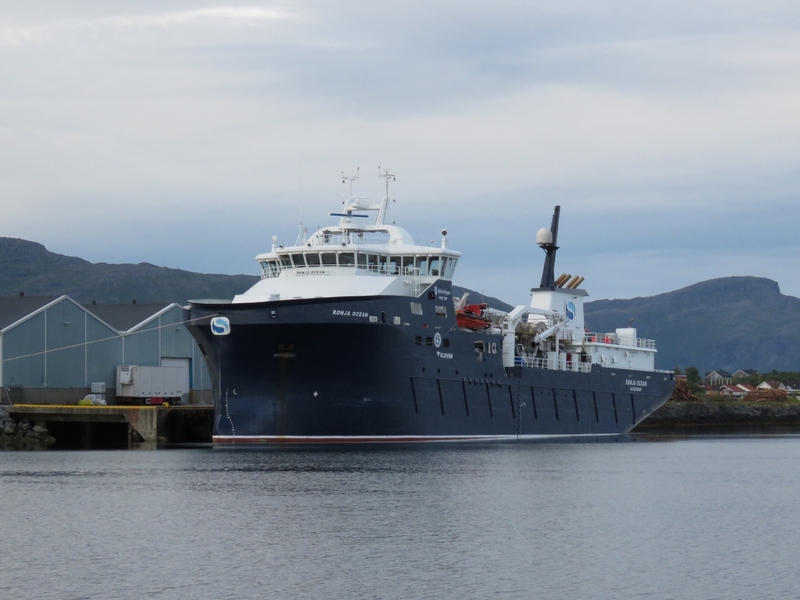 Now that we’ve spent some time on one, we’re noticing that they have a wide variety of ship designs. 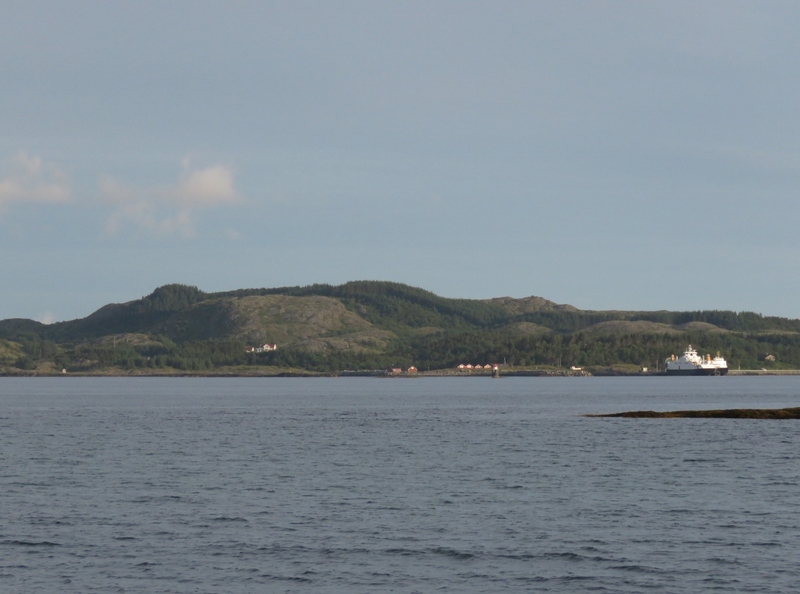 The view east from our anchorage at Hellesvika. Tomorrow we arrive into Trondheim. The Tjeungskjær lighthouse, that we also passed on the way north, nearly fills the small islet it is built upon. Spitfire enjoying a nice calm cruise. 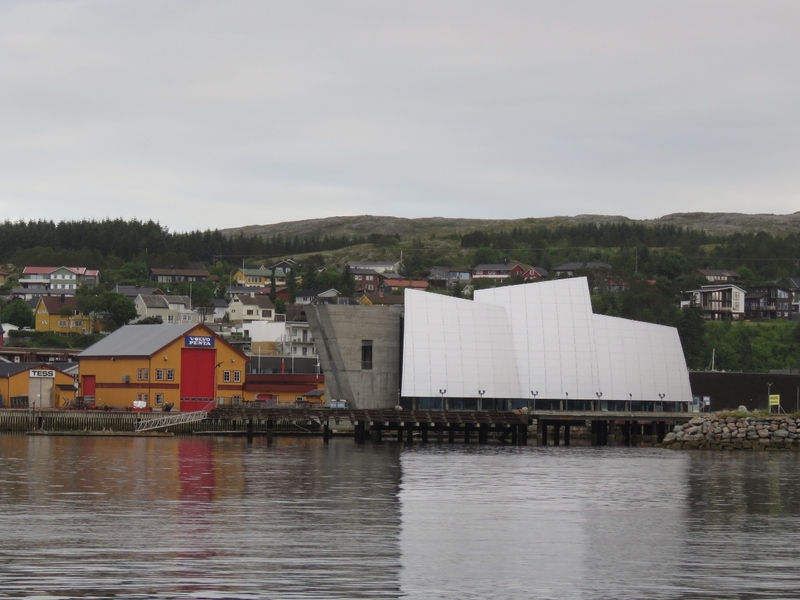 We’re now diverging from our route north as we turn east toward Trondheim. A tug was pulling this unusual tow down Trondheimsfjorden. Passing behind the breakwater at Trondheim harbor. 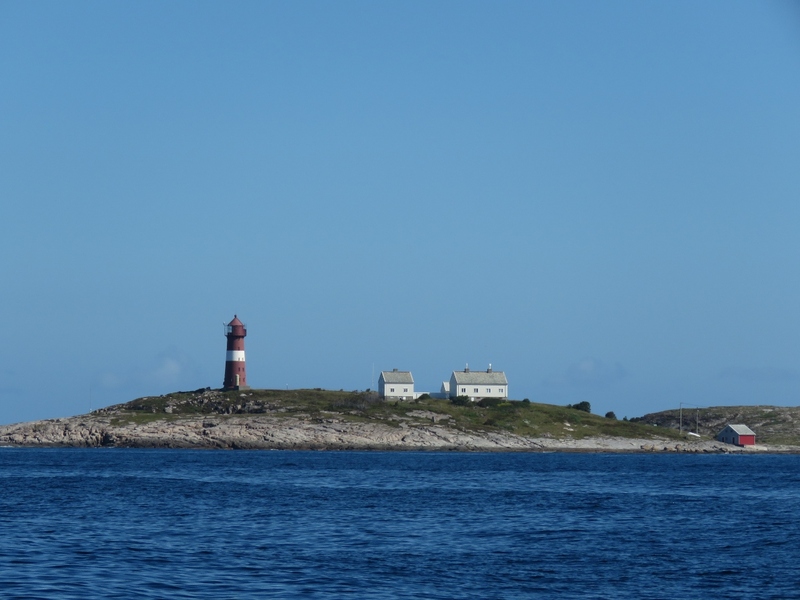 Skansen Gjestehavn to starboard as we pass along the breakwater. The main short-term guest pontoons are located here. 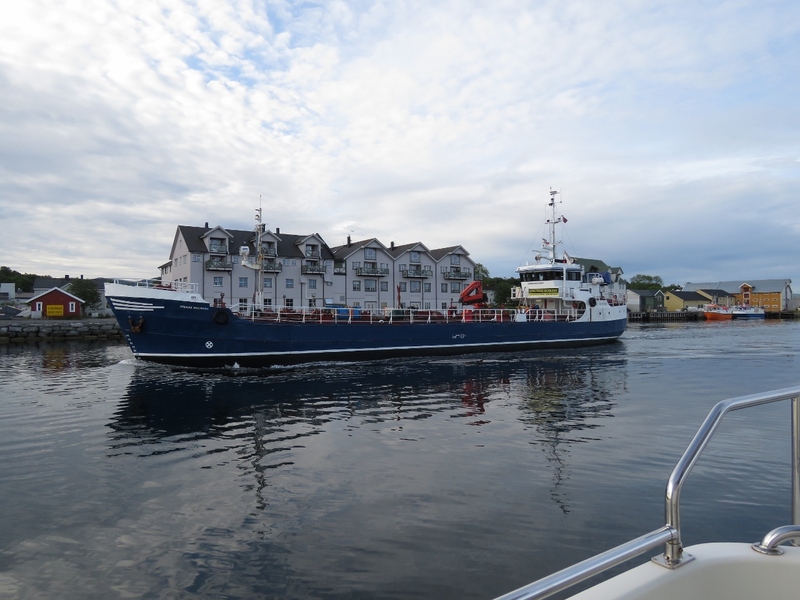 But we’ve got a berth for a month farther along. 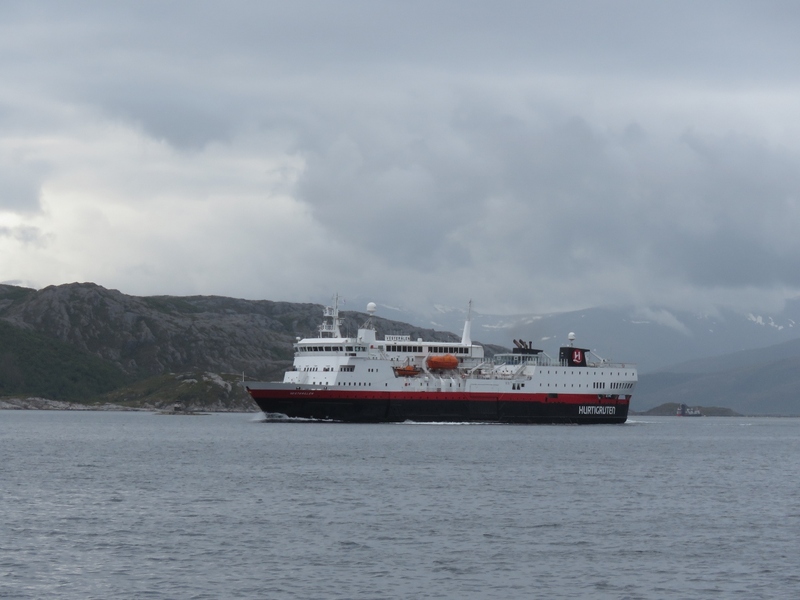 Our ‘gruten, the Kong Harald, departing Trondheim northbound. 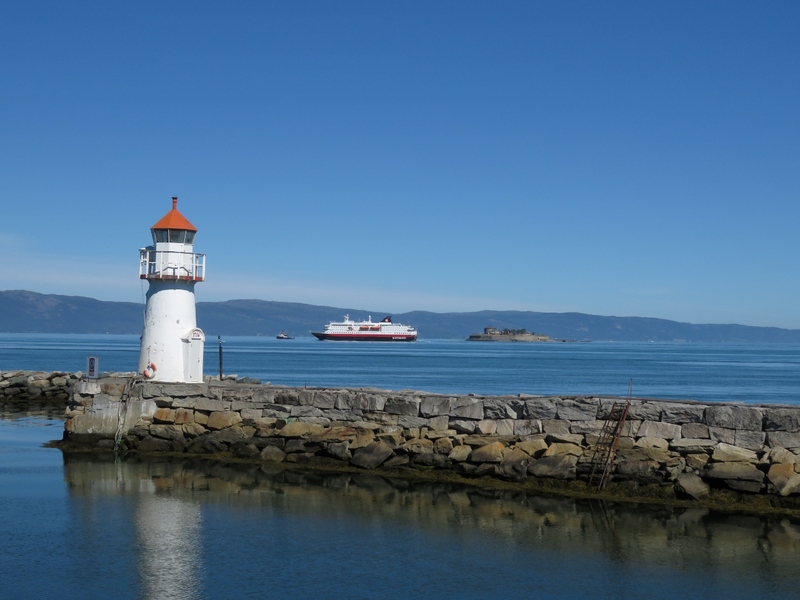 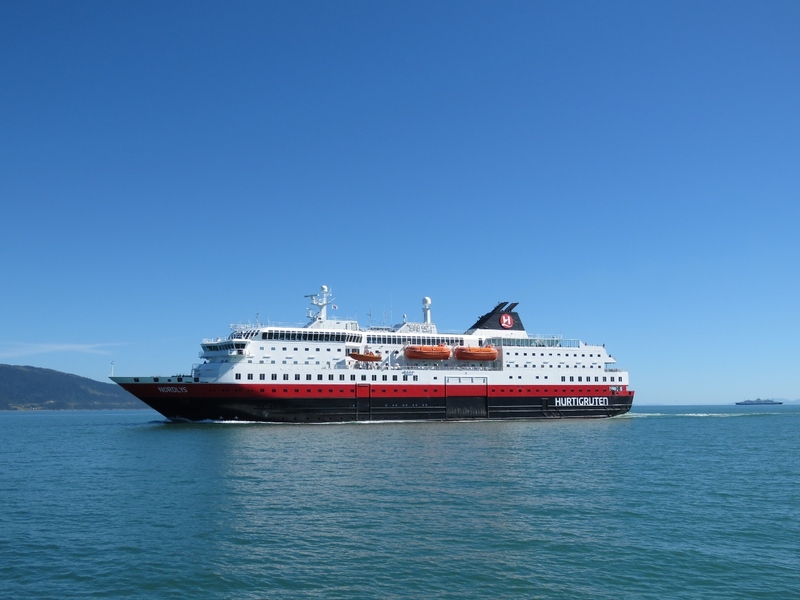 Trondheim is one of several cities along their route where the Hurtigruten ferry stops overlap. Passing through the Skansen railway bridge. 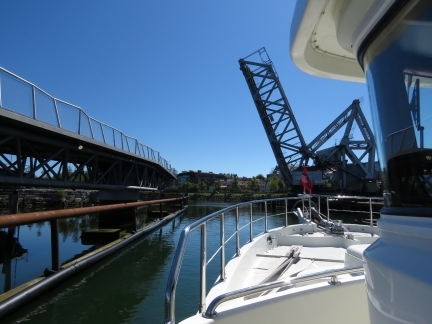 The bridge opens only at set times to allow railway traffic to pass—we’d timed our arrival for the 12:05 opening.. 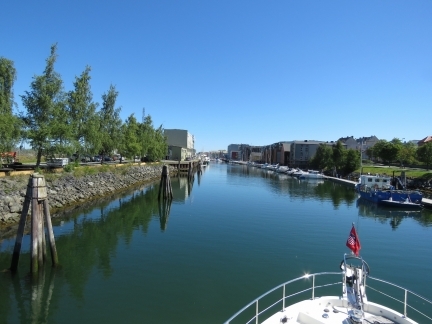 Entering Kanalhavn, the canal that runs from Skansen Bridge to the Nidelva River. 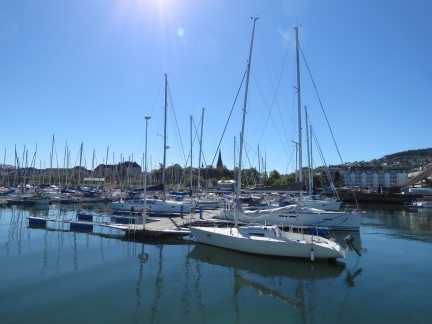 Moored at our home for the next month, Vestre Kanalhavn. We’re on a fixed, rather than floating dock, so have deployed long lines to allow for the 6ft tidal range. 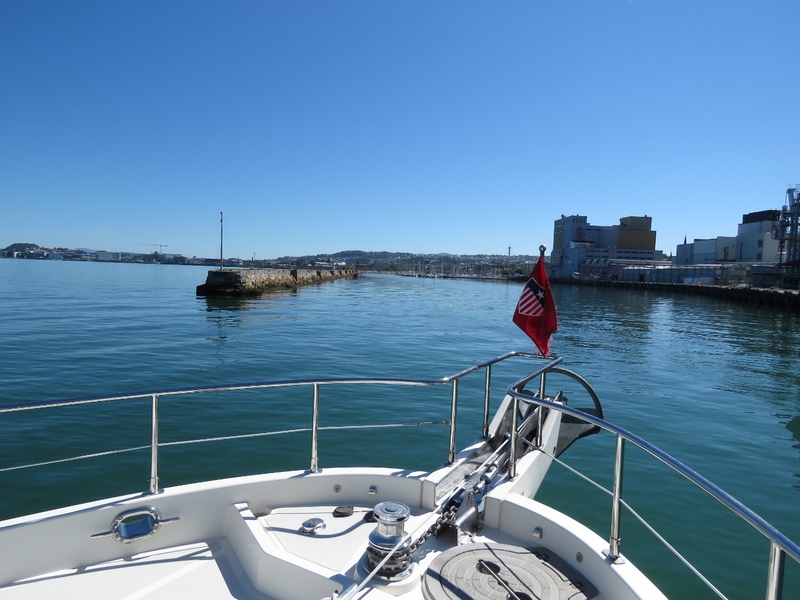 We’re using a 75-foot line off the bow, another as a forward spring, two 25-ft lines tied together as an aft spring line, and a 35-ft line off the stern. 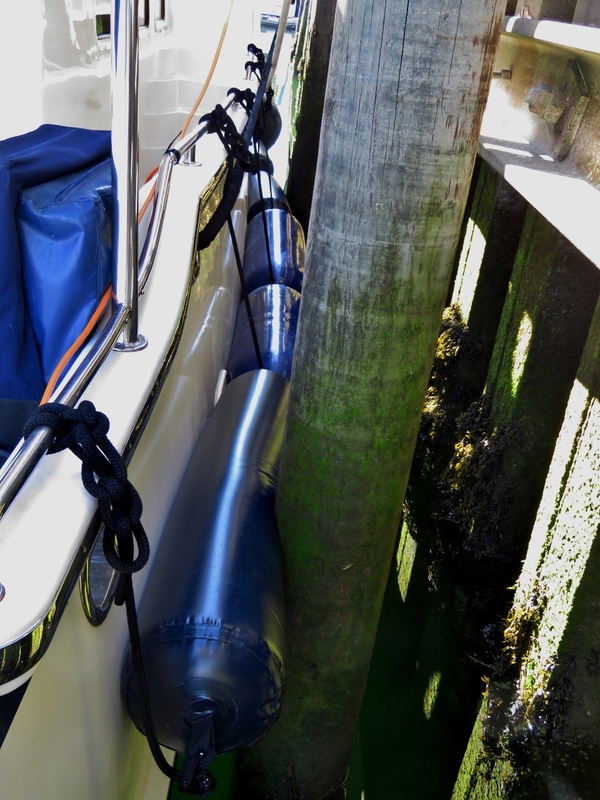 The shorter line off the stern keeps the boat relatively stable fore-and-aft with respect to a ladder that we’ll use to reach shore. 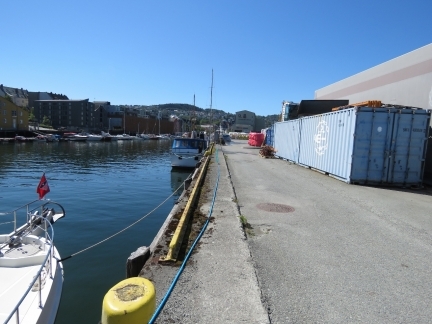 The fixed dock we’re on has widely-spaced pilings. 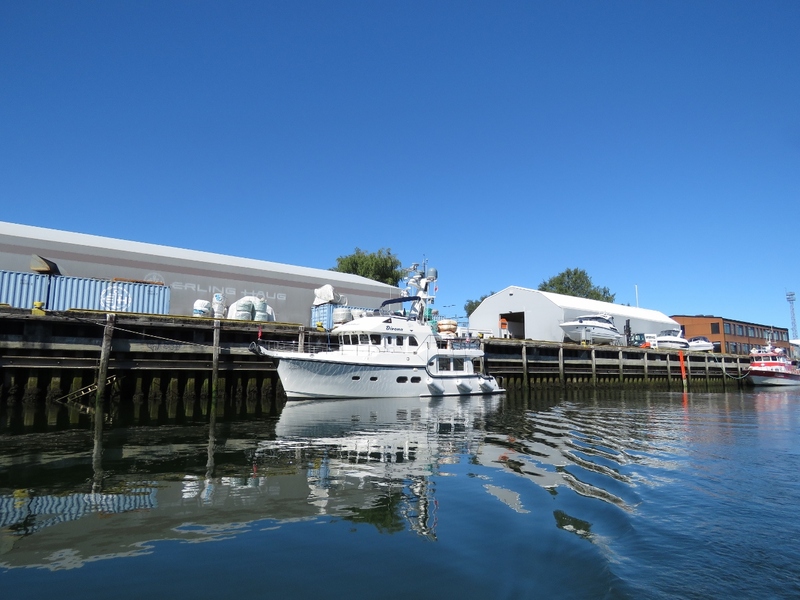 Dirona rests against only two pilings and the boat can more fore-to-aft due to the tidal range, so we’ve strung a row of fenders down the side of the boat. 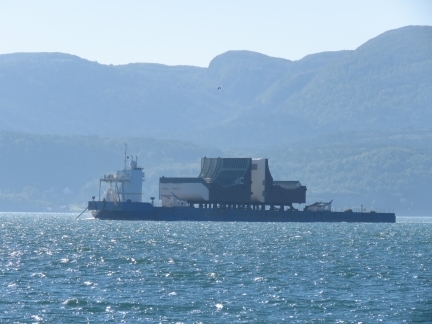 These include our two new Polyform F8 fenders and four of what we call “sausage” (1-f by 5-ft) inflatable fenders. 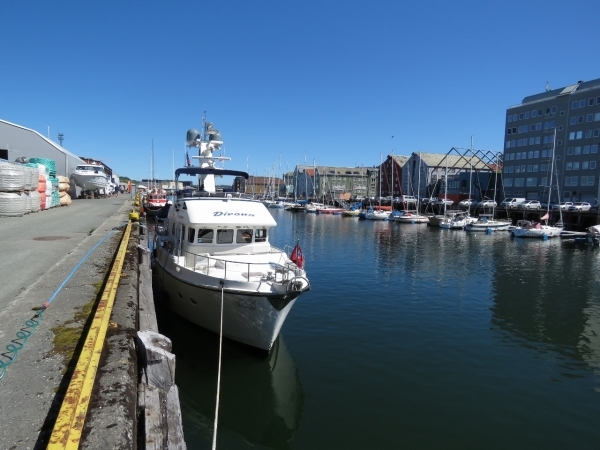 Shorepower is only 25ft behind the boat, but the water is 120ft away (adjacent to MY Spiti seen forward of Dirona). 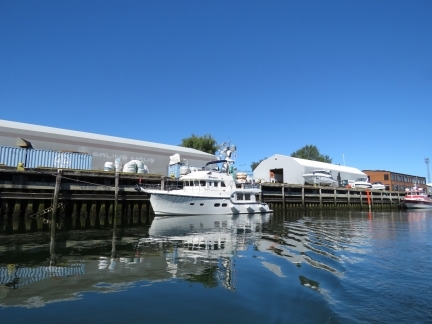 No problem—we just joined two 50-foot hoses and a coiled 25-foot hose and are now filling our tank. We dropped the tender in for a tour of the Trondheim waterways. 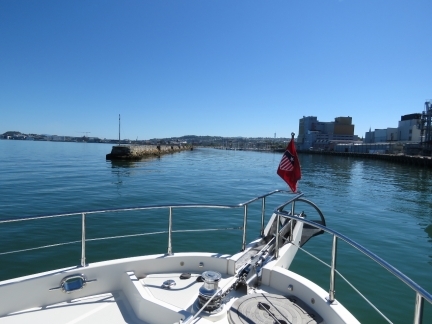 This is the view to our new home. Colorful 18th- and 19th-century riverfront warehouses on the river Nidelva that runs through Trondheim. 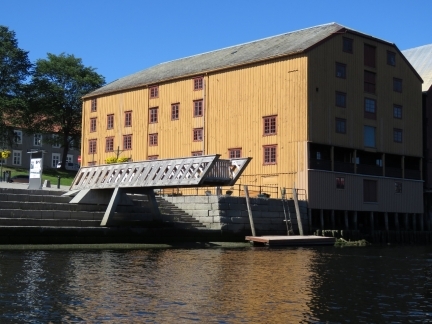 Viewing deck over the Nidelva River. 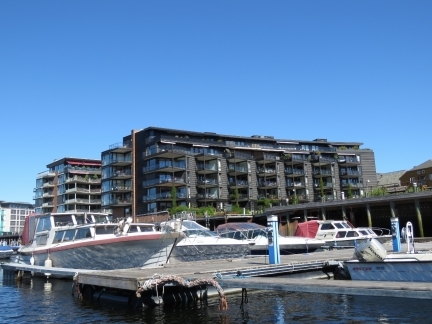 Beautiful apartments overlooking the Nidelva River south of the junction with Kanalhavn. 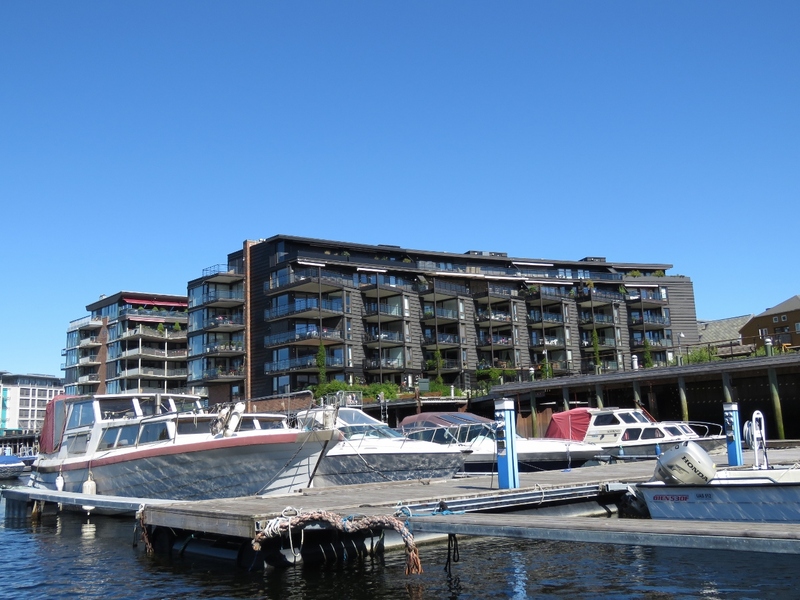 We moored the tender on a floating dock along the Nidelva River, just north of the junction with Kanalhavn. 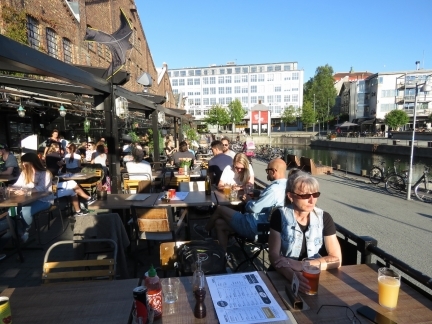 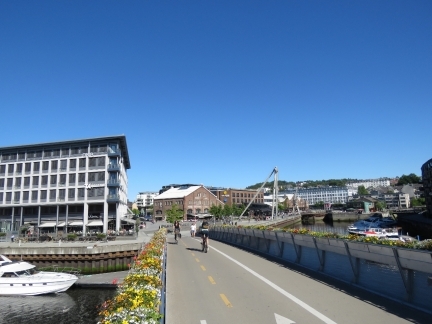 A great lunch on the patio at Egon, one of a dozen waterfront restaurants on Trondheim’s popular Solsiden district. The area was packed on this beautiful sunny day. 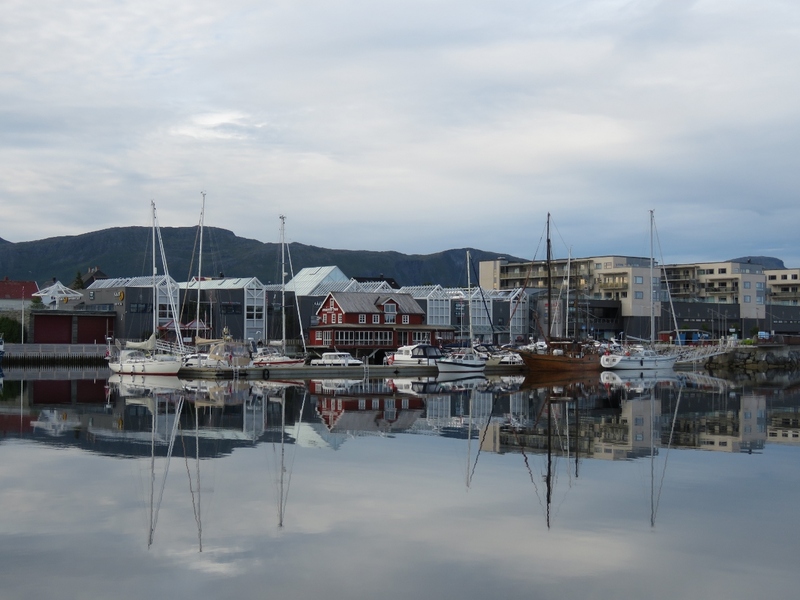 In the background are relics from Trondheim’s old working waterfront. 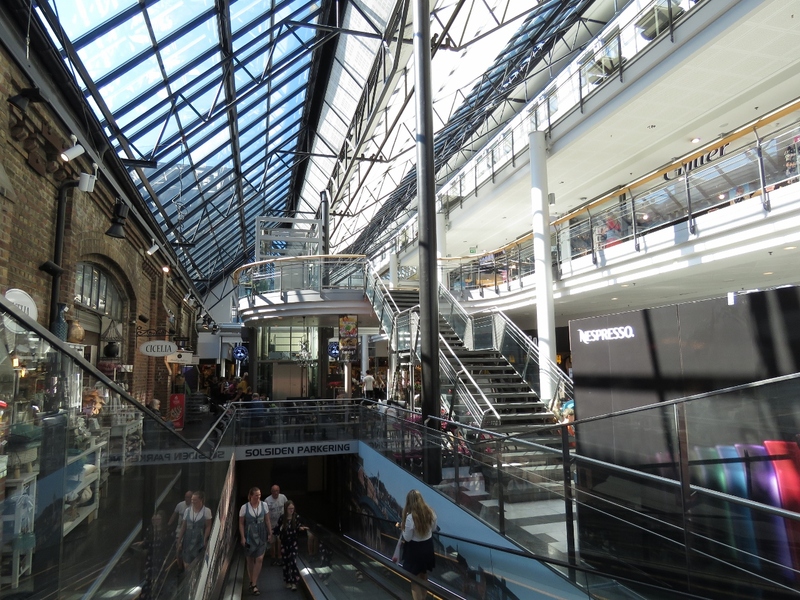 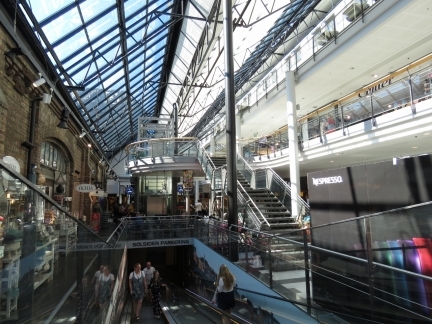 The glass-enclosed Solsiden mall is an upscale and popular shopping area. Pedestrian and bicycle overpass over the Nidelva River. The tender is moored off the bow of the boat at the left. 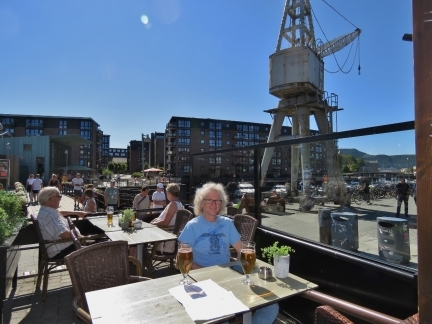 The old crane near Egon, where we had lunch, is visible in the distance. 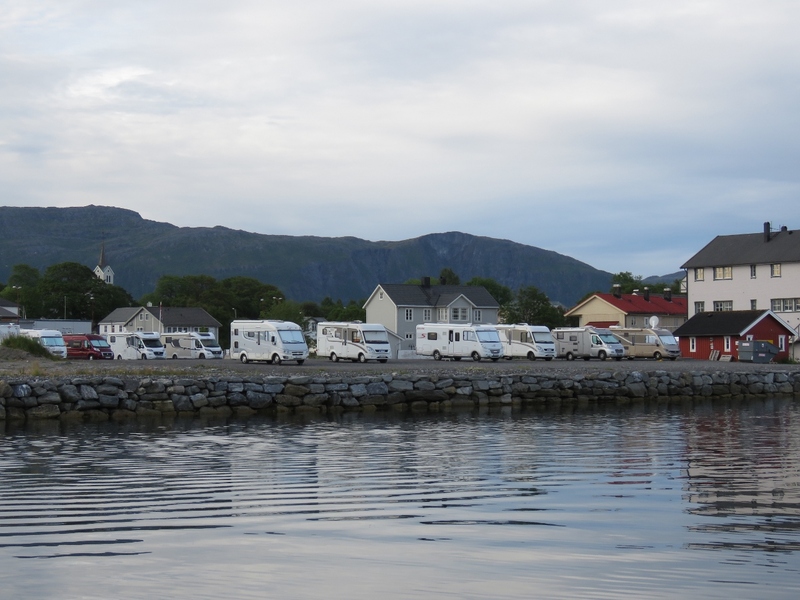 We returned on foot to the Solsiden district for an excellent pizza dinner at Selma. 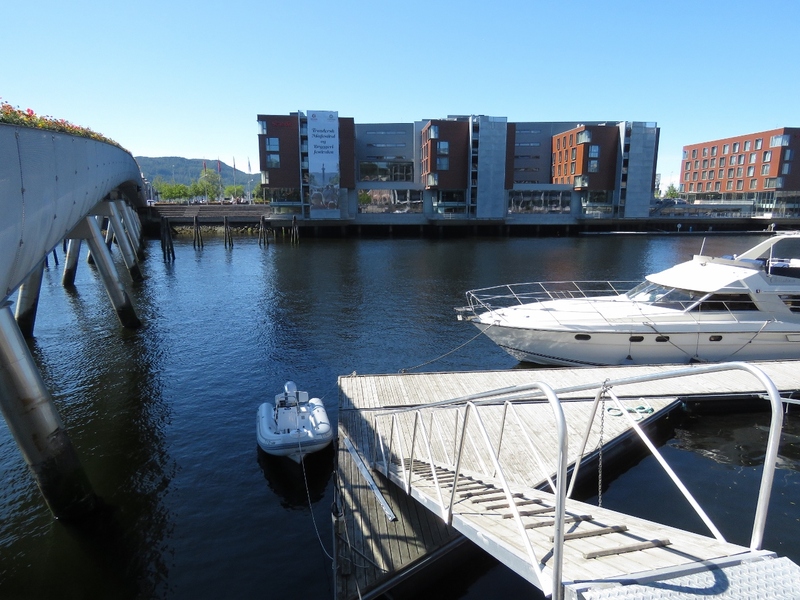 We’re really liking Trondheim so far.